This blog post, Back to School Lunch Ideas includes affiliate links and codes. If you decide to purchase using these codes or from the affiliate links I will earn a small amount of commission at no additional cost to you. I don’t know about you but my thoughts have definitely turned to the new school year and getting back to school. This year our school is taking care of the stationary lists (insert happy dance here) but I need to check Mr 7 still fits his uniform. We will need new school shoes for sure as they died a slow death in term 4 last year. But apart from that, all I really need to think about is back to school lunches. Click here to subscribe to the blog and receive your free lunchbox ideas list. Woo hoo! This free download includes an extensive list of main and snack options for school lunches. It also includes two blank weekly lunchbox planners for you to use to plan your school lunches! One planner is in full colour for printing and laminating and one is a print friendly version if you would like to print each week. You will never be stuck for ideas again! How are you feeling about getting back to school and back to school lunchbox packing? I know some of us can feel really overwhelmed about school lunches, especially in those first weeks. Not only that, it’s a tiring time getting everyone back (or starting) a school routine. 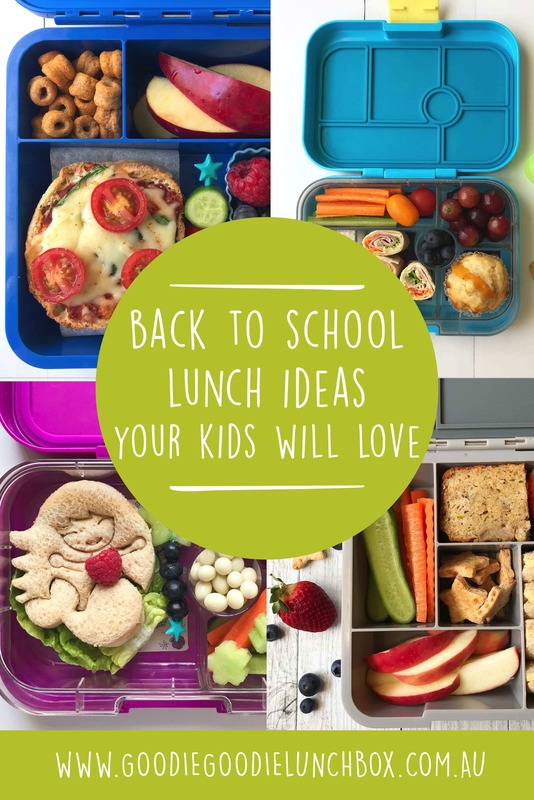 So why not ease into the school year and let me do the thinking for you with these delicious Back to School Lunch Ideas for your first week back to school? Back to School Idea 1: pizza for the win! 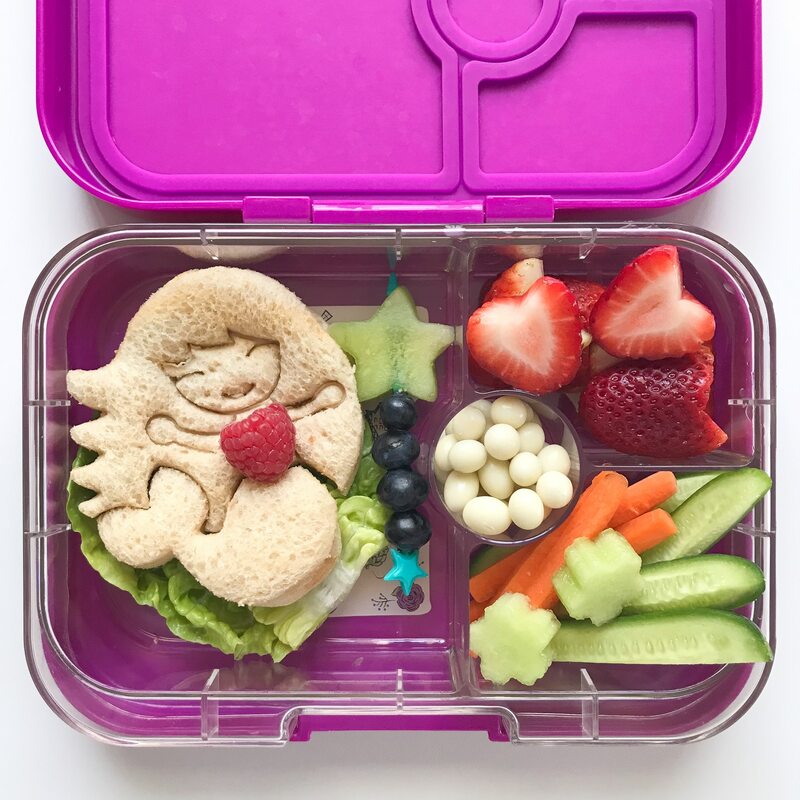 Kick the week off with a fun lunch that will entice little ones to eat their lunches! This lunch is packed in our Little Lunch Box Co Bento Three – a well designed lunchbox that is generously sized and one of our favourites! You can get a 10% discount by using my code GOODIE. Apple slices – to avoid browning soak apples in a salt water solution of a generous pinch of salt to one cup of water for 5 minutes. Rinse off and dry before packing. Back to School Lunch Idea 2: protein pack those lunchboxes! This Yumbox Original is a great smaller sized lunchbox ideal for under 8s (if you are looking for a bigger option check out the Yumbox Tapas). 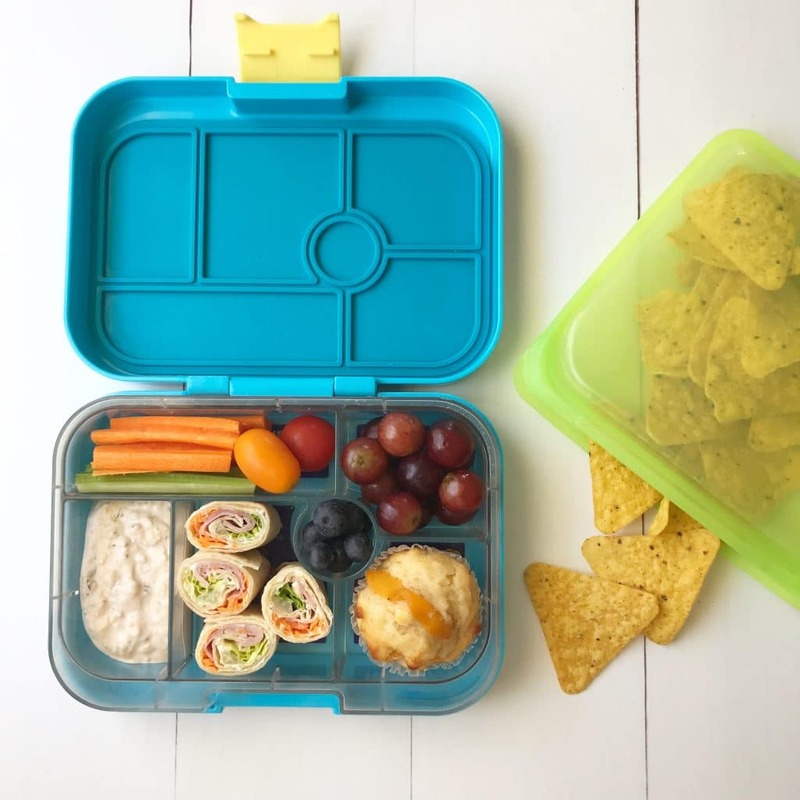 This lunchbox has been packed with a lot of protein options (tuna dip, wraps and muffin) which is important to keep tummies fuller for longer. Another tip for you is to use reusable silicone bags like this Stasher Bag in addition to the lunchbox to create some extra ‘room’. Use LUNCHBOX10 to receive a discount for the Yumboxes or Stasher bag. When it comes to lunch packing think protein to keep tummies fuller for longer! Back to School Idea 3: pita pockets are great in the lunchbox! Making lunches at the same time as you are making dinner helps save you time! For larger lunchboxes you can make smaller compartments by using silicone containers. The Little Lunch Box Co (remember to use my code GOODIE for 10% discount) has their own silicone cups which are perfect for their lunchboxes but you can get round silicone cups from Kmart or supermarkets. Back to School Idea 4: lunch box fun with sandwich sushi! This is a deadset favourite in our house and so easy to make. Simple cut the crusts from two slices of bread, spread each slice with cream cheese or similar, add a small amount of lettuce, carrot and ham and roll up like a sushi roll and cut into bite sized portions. 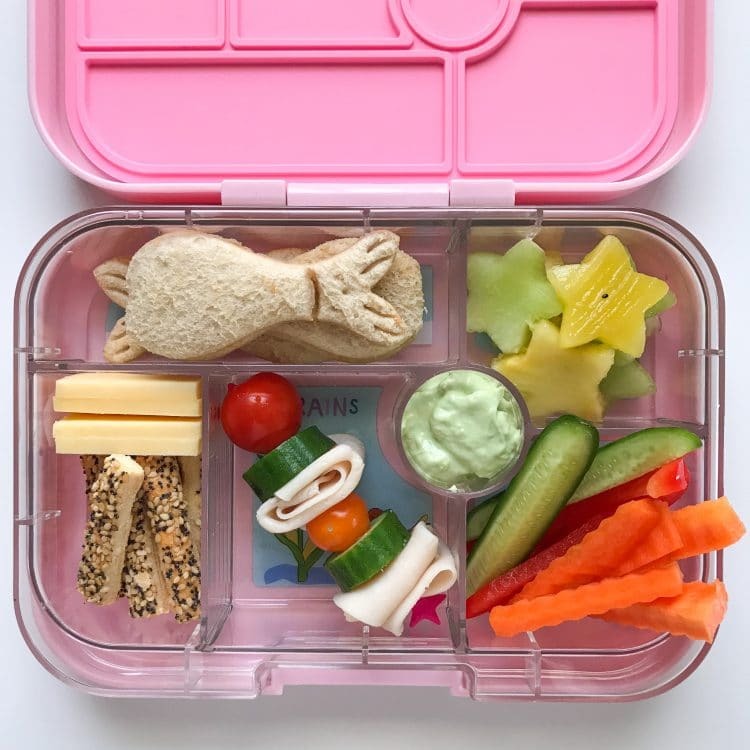 Back to School Idea 5: make lunch super cute with The Lunch Punch! Transform a simple sandwich into a work of art with The Lunch Punch. The Puzzle Cutter is probably our favourite cutter and suitable for older kids too! If you wish to purchase these sandwich cutters use my discount code GOODIE for 10% off your purchase. 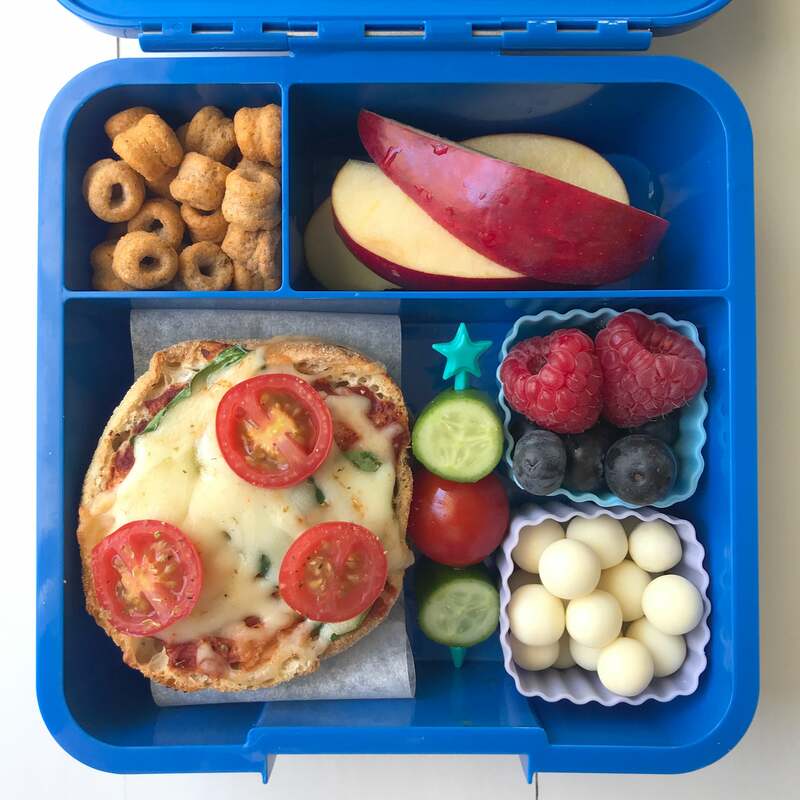 This Bento Five lunchbox from Little Lunch Box Co is a versatile lunchbox that is great for kids who love variety in their lunches. You can use my code GOODIE to receive 10% off. Lunch doesn’t have to be complicated! 🍎 A couple of different fresh fruit and veggie options, cheese and crackers, a sandwich cut with our favourite @thelunchpunch puzzle cutter and some delicious home baking like this yummo Sugar Free Carrot Cake Muffin (on the blog link in profile) and you have a great balanced lunch. 🍏 What are your favourite lunchbox additions? Before you get packing your school lunches read these tips first! Pack lunches the night before and prepare food in advance where you can. If food comes home uneaten, offer it for an after school snack or with dinner, sometimes kids are just too busy and overwhelmed to eat at school. I hope these back to school lunch ideas have been helpful. Don’t forget to download your free planner for more ideas! Happy lunching!